Doeringsfeld said, “The majority of what we ship is paper products manufactured by Clearwater Paper; peas and len- tils grown in the area; and container loads of wheat. Every- thing we grow within a hundred miles radius is exported overseas. The port allows us to cater to export markets.” “We move a lot of bulk grain shipments out of here. Bulk wheat shipments are the main commodities shipped on the Columbia/Snake River system. In the past, the Port of Lewiston had space for only one barge at a time at its dock, but after recent improvements, two barges fi t comfortably. Now, said Doeringsfeld, “We’ll be able to load one while we’re unloading another. It also opens up some ‘break bulk’ opportunities. Lewiston’s dock is 250-feet long and capable of handling any roll-on/roll off cargo allowed on area highways. 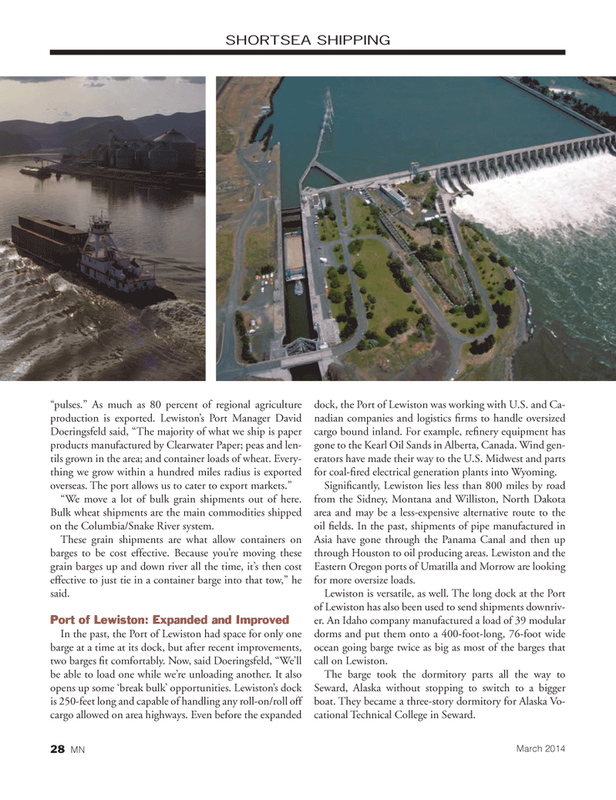 Even before the expanded dock, the Port of Lewiston was working with U.S. and Ca- nadian companies and logistics fi rms to handle oversized cargo bound inland. For example, refi nery equipment has gone to the Kearl Oil Sands in Alberta, Canada. Wind gen- erators have made their way to the U.S. Midwest and parts for coal-fi red electrical generation plants into Wyoming. Eastern Oregon ports of Umatilla and Morrow are looking for more oversize loads. Lewiston is versatile, as well. The long dock at the Port of Lewiston has also been used to send shipments downriv- er. An Idaho company manufactured a load of 39 modular dorms and put them onto a 400-foot-long, 76-foot wide ocean going barge twice as big as most of the barges that call on Lewiston. Seward, Alaska without stopping to switch to a bigger boat. They became a three-story dormitory for Alaska Vo- cational Technical College in Seward.